Ron Fuller was born in 1936 and went to Art Schools in Plymouth and Falmouth before studying Art and Theatre Design at the Royal College of Art. 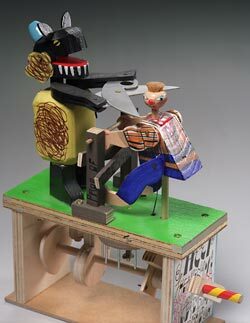 After a career in teaching he began making wooden toys for a living in 1972. He developed many techniques for producing his toys in short production runs. His work is highly sought after and has been exhibited and sold in specialist shops all over the world. 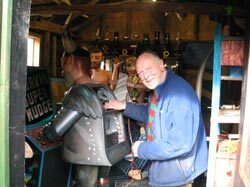 Ron was involved with Cabaret Mechanical Theatre since it began and has produced a number of designs exclusively for CMT, such as the ever-popular Lion Tamer and Sheep Shearing Man. 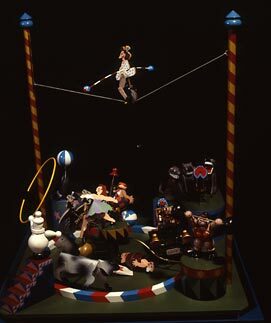 He also made larger scale pieces such as The Circus, and the Ticket Stamping Man for the entrance to the Theatre. A larger than life-size cooper that Ron made can be seen working at a beer barrel on the roof of a pub that overlooks Trafalgar Square. Plans for some of Ron’s designs can be seen in the book Simple Wooden Toys (Quarto Publishing 1995). In 2002 Ron designed a set of circus stamps for the Royal Mail. See also. Despite his wide experience Ron Fuller always described himself as a village toymaker. His toys lie somewhere between turn of the century German mechanical tin-toys and the painted wooden craft of Sam Smith. Ron died in July 2017. Simon Tait wrote this article about Ron in 2010.